Arthur Dixon started the Birmingham Guild of Handicraft in 1895. Its aim was to produce work in precious and non-precious metals. Like Charles Robert Ashbee's Guild of Handicraft, the work of the Birmingham Guild was simple in shape and the ornament austere. The surfaces were softly planished rather than brilliantly polished. The aims and organisation of the Birmingham Guild, however, were more thoroughly commercial than those of the Guild of Handicraft. 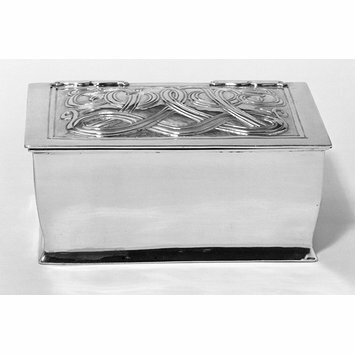 Silver, the hinged lid decorated with embossed and engraved stylised interlacing foliage. BGHO all within a triangular shaped shield for the Birmingham Guild of Handicraft. Birmingham hallmarks for 1898-9. Arthur Dixon started the Birmingham Guild of Handicraft in 1895 to produce work in precious and non precious metals. Like Ashbee's Guild of Handicraft, the work of the Birmingham Guild was simple in shape, the ornament austere and the surfaces softly planished rather than brilliantly polished. Their aims and organisation however were more thoroughly commercial than those of Ashbee's. Silver, Birmingham hallmarks for 1898-9, mark of the Birmingham Guild of Handicraft.